For more than a decade, Rep. Bill Pascrell, D-N.J., has routinely coasted to re-election over token opposition in the Democrat-dominated 8th Congressional District. This year is different, and the eight-term congressman – a close Capitol Hill ally of Islamist groups like the Council on American-Islamic Relations (CAIR) – is fighting for his political life. After the New Jersey Legislature eliminated fellow Democratic Rep. Steve Rothman's neighboring district last year, he decided to run against Pascrell in the new, heavily Democratic 9th Congressional District. Before redistricting, the two men (both of them liberals first elected to Congress in 1996) were considered political allies. With the primary less than two months away, they have been transformed into bitter opponents. Rothman supporters are emphasizing his strong support of Israel, contrasting it with that of Pascrell – one of 54 House members who joined Rep. Keith Ellison, D-Minn., in sending a January 2010 letter to President Obama denouncing Israel and Egypt for blockading Hamas-ruled Gaza. The letter accused Israel of imposing "de facto collective punishment of the Palestinian residents of the Gaza Strip." Former AIPAC spokesman Josh Block said the differences between Rothman and Pascrell on Israel couldn't be clearer. Pointing to the letter to Obama, Block told the New Jersey Jewish Standard in January that Pascrell (whose hometown of Paterson includes large Arab and Muslim populations) had "actually sided against American support for Israel's right to defend herself against weapons smuggling and attacks by terrorists." Thus far, there are no public-opinion polls measuring whether the perception that Pascrell is hostile to Israel is damaging him politically. But Orthodox Jewish leaders in the district have launched a campaign to persuade registered Republicans to change their registration to Democrat in order to vote for Rothman in the June 5 primary. Earlier this month, a local newspaper reported that since New Year's Day, a net total of 900 voters registered as Republican or unaffiliated had switched their registration to Democrat, with less than 200 switching the other way. Collaborating with CAIR. Despite its established roots in the Islamic Association for Palestine, a Hamas front group, Pascrell speaks with pride about his connections with CAIR. The organization's website includes a glowing testimonial from Pascrell in which he "personally commend[s] CAIR for its work on issues including civil liberties" and calls it "the preeminent organization representing the concerns of Muslim Americans." *Whitewashing the radical record of Imam Mohammad Qatanani. Qatanani, imam at the Islamic Center of Passaic County, was targeted for removal from the United States for failing to disclose his Israeli court conviction for membership in Hamas. Qatanani has also made comments condemning Christians to eternal hellfire and advocating support for the children of suicide bombers. Pascrell lobbied against Qatanani's deportation from the United States and submitted a court affidavit calling the imam "peace-loving and magnanimous." Refusing to condemn anti-Semitic slurs by his political supporters. In February, Arab-American activist Aref Assaf, a Pascrell supporter and contributor, suggested that Jews who support Rothman are putting Israel's interests over those of America. Pascrell refused to condemn Assaf. Earlier, the congressman refused to condemn one of his fundraisers, Lebanese-American businessman Sami Merhi, who had likened Israeli Prime Minister Ariel Sharon to Hitler while speaking at a Pascrell fundraiser. Disparaging law-enforcement efforts to acquire intelligence on radical groups. Although he has refused to criticize political allies for anti-Semitic remarks, Pascrell has not hesitated to attack law enforcement agencies like the New York Police Department based on incorrect information. He criticized the NYPD for using "religious profiling" in conducting surveillance at New Jersey mosques and suggested the NYPD had conducted surveillance without communicating with New Jersey officials – despite considerable evidence to the contrary. Ridiculing the existence of a jihadist threat. At a House Homeland Security Committee hearing on radicalization last year, businessman Melvin Bledsoe testified about his son's transformation from a normal American teenager into a jihadist. Pascrell mocked the premise that Islamist terror deserved any special concern, saying that "some pretty bad people" are Catholics. He belittled Bledsoe's call for American unity against jihadist recruitment, denying that any divisions exist. "When you say 'the other side,' I don't know what the hell you're talking about," Pascrell said. Islamists on Capitol Hill have few better allies than Rep. Bill Pascrell, D-N.J. A former mayor of Paterson, Pascrell, 75, is in his eighth term representing Passaic County in New Jersey's 8th Congressional District. He is an outspoken critic of congressional efforts to investigate Muslim radicalization in the United States and a top ally of the Council on American-Islamic Relations (CAIR). Redistricting has placed Pascrell in the new 9th Congressional District with fellow Democratic Rep. Steve Rothman, prompting a tough June 5 primary. Like Pascrell, Rothman (whose old district was dismantled in redistricting) is a liberal Democrat who entered Congress in 1997. But the two men have very different records on Israel. Rothman is a strong supporter of the Jewish state. Pascrell, by contrast, was one of 62 lawmakers, including them Rep. John Conyers, D-Mich., Rep. Jim Moran, D-Va., and Rep. Loretta Sanchez D-Calif., who signed a January 2009 letter to Secretary of State Hillary Clinton suggesting that Israel was to blame for denying critically needed aid to Palestinian residents of Gaza. CAIR's New Jersey chapter (CAIR-NJ) issued an "Action Alert" urging supporters to thank signers of the letter for "their support of human rights" by "address[ing] the humanitarian crisis in Gaza." The letter neglected to mention the role played by Gaza's ruling Hamas regime in creating the humanitarian crisis by provoking war with Israel and exacerbating the situation through its extensive use of civilian human shields. Pascrell was one of 54 House members (including Minnesota Democratic Rep. Keith Ellison), who signed a one-sided letter in 2010 to President Obama accusing Israel of imposing "de facto collective punishment of the Palestinian residents of the Gaza Strip." The Hill reported that after Pascrell signed the 2010 letter, Rothman (at that time a political ally) defended his colleague's record on Israel. These days, Rothman and his supporters are singing a different tune about Pascrell. Although Pascrell has portrayed himself as pro-Israel, his efforts to do so in the current campaign have been marred by missteps. He won the endorsement of New Jersey real-estate mogul David Steiner, who formerly served as president of the American Israel Public Affairs Committee (AIPAC), only to learn that Steiner resigned in disgrace after exaggerating the organization's power to choose President Clinton's cabinet. "I'm not sure why Pascrell proactively calls attention to how little support he has within the pro-Israel community," one New Jersey Democrat told the Washington Free Beacon. "First, he bragged about the endorsement of a one-term, 80-plus year-old congressman (former Democratic Rep. Herb Klein) and now the endorsement of a former president of AIPAC who embarrassed AIPAC so much when he was president that they forced him to resign." Pascrell's bid for Jewish votes has been further undercut by his refusal to denounce local Arab-American activist Aref Assaf, who responded angrily to reports that Orthodox Jewish Republicans might change their party registration in order to vote for Rothman in the Democratic primary. "As total and blind support for Israel becomes the only reason for choosing Rothman, voters who do not view the elections in this prism will need to take notice: Loyalty to a foreign flag is not loyalty to America's," wrote Assaf, president of the American Arab Forum (AAF) which posted the op-ed on its website. Rothman supporters demanded that Pascrell disavow Assaf's comments, but he refused. Assaf subsequently termed complaints about his column "Islamophobia" and "deplorable blanket racism." He published another op-ed on the primary suggesting Pascrell was under fire from "Jewish sources" because he is not regarded as "a perfect example of an Israeli loyalist." "While some of Rothman's supporters put the flag and the security of another country above ours, we place America first and unconditionally," Assaf wrote. "While they put Israel first, we place America second to none." Asked about Pascrell's refusal to repudiate Assaf's comments, veteran Democratic Party activist Joshua Block didn't mince words. "The unwillingness to directly confront and condemn this anti-Semitic invective and bigotry is despicable," said Block, a former spokesman for the American Israel Public Affairs Committee (AIPAC). "Silence in the face of this kind of hate speech says it all." But Passaic County Democratic Party leaders view the matter differently. On March 24, party executive leaders unanimously endorsed Pascrell. He "was the best choice and had the most experience on the diverse issues that affect Passaic County," said county Democratic Party Chairman John Currie. Assaf is not the first political ally Pascrell has refused to condemn for making anti-Semitic comments. Speaking at a Pascrell fundraiser in 2002, Lebanese-American businessman Sami Merhi likened then-Israeli Prime Minister Ariel Sharon to Adolf Hitler and said he "can't see the comparison" between the 9/11 hijackers and Palestinian suicide bombers. When Merhi ran for a seat as Passaic County freeholder in 2006, senior New Jersey Democrats like Sen. Robert Menendez repudiated his remarks and said they couldn't support his candidacy. Pascrell called the comments a "mistake," but refused to abandon Merhi, a friend who has raised money for the congressman's previous campaigns. "He's a well-vetted candidate," Pascrell said of Merhi. "I believe he's a good man, and he'll represent all the people of Passaic County." But Pascrell's support wasn't enough to save Merhi. One week after endorsing his nomination, the Passaic County Democratic screening committee reversed itself, voting 20-3 to withdraw its support. "Political lynching of Arab Americans is now an accepted practice," Assaf said. "Every Arab American is now Sami Merhi." Assaf accused a Jewish official who supported Merhi's ouster of seeking "to transform (sic) the conflict between Arabs and Jews from the streets of Jerusalem to the streets of Passaic County." 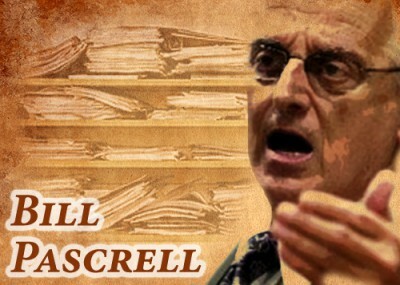 Connections with Assaf and CAIR are not just an embarrassing problem for Pascrell. Gary Schaer, a prominent Democratic state assemblyman whose endorsement prompted 15 local Orthodox synagogues to back Rothman, blasted Assaf last month for impugning the motives of Jewish voters. But as recently as December, Assaf and Schaer were on much friendlier terms. They appeared together at CAIR-New Jersey's annual banquet, where Assaf made a "special presentation" to Schaer – giving him the "CAIR-NJ 2011 Public Leadership Award" for "his dedication to protecting the civil and religious rights of all citizens." While he has avoided repudiating anti-Semites and conspiracy mongers, Pascrell has shown less reticence about criticizing the New York Police Department (NYPD) for using "religious profiling" in surveillance at New Jersey mosques. He suggested the NYPD had conducted surveillance without communicating with New Jersey officials despite considerable evidence to the contrary. Pascrell is a leading congressional ally of CAIR, which has established roots in the Islamic Association for Palestine (IAP), an organization found to be a front group for Hamas. Prosecutors designated CAIR an unindicted co-conspirator in prosecuting senior officials with the Holy Land Foundation for Relief and Development (HLF). CAIR was designated because of its associations with the U.S. Muslim Brotherhood's Palestine Committee. The Palestine Committee was created to provide Hamas with financial and political support in the United States, prosecutors said. Five senior HLF officials were convicted of all charges for funneling approximately $12 million to Hamas and sentenced to prison terms ranging from 15 to 65 years. The FBI cut off contact with CAIR in 2008 based on evidence in the HLF case, writing that "until we can resolve whether there continues to be a connection between CAIR or its executives and HAMAS, the FBI does not view CAIR as an appropriate liaison partner." But longstanding concerns about CAIR's radical record haven't prevented Pascrell from forging close ties with the organization. "With over 30 CAIR Chapters spread throughout the United States and Canada it is clear that CAIR has become the preeminent organization representing the concerns of Muslim Americans. I want to personally commend CAIR for its work on issues including civil liberties and opening dialogue with various communities in America." Pascrell was one of 23 members of Congress who printed proclamations in the program at CAIR's 12th annual national banquet in November 2006. He was one of nine members who printed proclamations at CAIR's 2008 national banquet. "Since 2003, the Council on American-Islamic Relations' New Jersey Chapter has encouraged progressive dialogue throughout my district and throughout many New Jersey communities. The New Jersey Chapter's hard work does not go unrecognized by this office," Pascrell wrote. "I want to offer my heartfelt congratulations … to wish you the same success in the future you have had in your past." Pascrell joined three other members of Congress in publishing proclamations at CAIR's 2009 national banquet. In March 2007, Pascrell created a stir after he reserved a conference room in the U.S. Capitol for a CAIR panel discussion entitled "Global Attitudes on Islam-West Relations: U.S. Policy Implications." The panel included Steven Kull, director of the Program on International Policy Attitudes, who analyzed polls on relations between Muslims and the West, and CAIR Executive Director Nihad Awad. Pascrell spokesman Caley Gray said the forum "opens up an important dialogue about global public opinion concerning the United States." "We see it as a simple room request," said Gray. "We did receive a room request and evaluated it and approved it." Not everyone on Capitol Hill regarded it as an ordinary request. "It does happen all the time, but usually it is the United Way or some constituent group or Mothers Against Drunk Driving, not a group with supposed ties to terrorism – in the Capitol no less," a Hill staffer said at the time. "We know [CAIR] has ties to terrorism," said New York Democratic Sen. Charles Schumer, a member of the party's Senate leadership. Schumer criticized CAIR for having "intimate links with Hamas." In February 2004, CAIR's New Jersey office issued a statement praising Pascrell and Sen. Jon Corzine, D-N.J., for condemning New York Republican Rep. Peter King's assertion that most American mosques were controlled by radicals. Pascrell and Corzine both spoke at the Annual Community Brunch held by the American Muslim Union (AMU) on Feb. 21, 2004, which was cosponsored by 10 other organizations, including CAIR-NJ and the Islamic Center of Passaic County (ICPC). Magdy Mahmoud, co-founder and president of CAIR's New Jersey chapter, was another cosponsor of the AMU brunch, Joel Mowbray reported in the Boston Sun the following month. Mahmoud served on the executive board of the Muslim Arab Youth Association (MAYA) from 1993-98 and directed MAYA's chapters committee. During Mahmoud's tenure, the organization hosted a 1995 event in Toledo where Imam Yusuf al-Qaradawi praised Hamas and Palestinian Islamic Jihad. "Our brothers in Hamas, in Palestine, the Islamic resistance, the Islamic Jihad, after the rest have given up and despaired, the movement of the jihad brings us back to our faith," Qaradawi declared. In the same speech, Qaradawi advocated the killing of Jews. He said that "the balance of power will change, and this is what is told in the Hadith of Ibn Omar and the Hadith of Abu-Harairah: 'You shall continue to fight the Jews and they will fight you, until the Muslims will kill them. And the Jew will hide behind the stone and the tree will say: Oh servant of Allah, Oh Muslim, there is a Jew behind me. Come and kill him!' The resurrection will not come before this happens. This is a text from the good omens in which we believe." Qaradawi vowed that Muslims would conquer Europe and the United States. "Islam will come back to Europe for the third time, after it was expelled from it twice," Qaradawi said. "We will conquer Europe; we will conquer America! Not through sword but through Da'wa [proselytizing]." The Dar-ul-Islah Islamic Center also sponsored the brunch. Co-founder Waheed Khalid has defended Hamas and declined comment when asked whether he believed the Protocols of the Elders of Zion were forgeries. Asked about Hamas activities by the Bergen Record in 1998, Khalid replied: "They are trying to get the occupiers out of their home." Mohammed El-Mezain, one of the five HLF officials convicted in 2008, co-founded the Islamic Center for Passaic County in 1989 and served as its first imam. According to a memorandum written by former FBI Assistant Counterterrorism Director Dale Watson, Mezain (serving a 15-year prison term for his HLF conviction) claimed in a 1994 speech at the mosque that he raised $1.8 million in the United States for Hamas. In February 2003, the ICPC reportedly hosted Islamist militant Abdelhaleem Ashqar, later sentenced to 11 years in prison for criminal contempt and obstruction of justice after refusing to testify before a federal grand jury investigating Hamas support in the United States. Pascrell described as "pure crap" allegations that any cosponsors of the February 2004 community brunch were radical Islamists or linked to terrorist organizations. Asked by Mowbray if he believed that he was providing legitimacy to radical organizations by appearing at the event, Pascrell replied: "I'm not going to deal in rumors. The rest is crap. I know these men as fine family men." A Pascrell spokesman later clarified that his boss was not referring to Alaa al-Sadawi, former imam at El Tawheed Islamic Center in Jersey City (another sponsor of the event), who was convicted in 2003 and sentenced to five years, three months in prison for attempting to smuggle $659,000 to Egypt. Sadawi raised money for the Global Relief Foundation, designated a terrorist financier by the Treasury Department for its links with al-Qaida. (He later pleaded guilty to lying in order to obtain U.S. citizenship). "That guy should be in jail," the spokesman said of Sadawi. "But you can't hold the members of the mosque responsible for his actions." Another imam at the Islamic Center of Passaic County, Mohammad Qatanani, was accused of lying on his U.S. immigration documents when he failed to disclose his confession to Israeli authorities that he was a member of Hamas, and his Israeli court conviction for membership in the terror group. A federal immigration judge ruled in favor of Qatanani in 2008, but the Board of Immigration Appeals overturned part of the order the following year, holding that Judge Alberto Riefkohl had erred in downplaying Israeli evidence showing Qatanani's links with Hamas. Qatanani spoke at a November 1999 IAP conference. Mousa Abu Marzook, a senior Hamas official, gave the organization $490,000 and is a former IAP board member. Evidence at the HLF trial showed the IAP played a central role in the Muslim Brotherhood's Palestine Committee – in essence Hamas' U.S.-based infrastructure. In a September 2004 article in the New Jersey Herald-News, Qatanani advocated supporting the children of suicide bombers. During the HLF trial, he publicly prayed for the Hamas-linked defendants and delivered a sermon condemning Christians to eternal hellfire. In another sermon, Qatanani suggested that all of Israel, Jordan, Lebanon, the West Bank and Gaza were part of "Greater Syria" and that fighting to conquer these lands is a divine commandment for Muslims. These sermons were available in English on the mosque's website. None of this stopped Pascrell from praising Qatanani and lobbying on his behalf. When the imam faced deportation, Pascrell submitted a court affidavit calling Qatanani "peace-loving" and "magnanimous." "As a religious leader, Imam Qatanani has had an enormously positive impact in my district," the congressman wrote. "Our community would suffer a serious loss should he be required to leave." 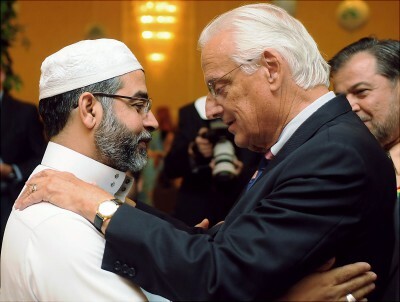 Bill Pascrell warmly greets Imam Mohamad Quatanani during a 2009 interfaith event marking the start of Ramadan. Photo by The Record and Herald News. Hours after federal immigration Judge Alberto J. Riefkohl's 2008 ruling that Qatanani could remain in the United States, Pascrell joined Gov. Chris Christie and other officials in paying tribute to the imam. At a breaking of the Ramadan fast in Paterson that evening, Pascrell gushed about Qatanani. "You put so much time into bringing peace for all of us," Pascrell told him. "Thank you imam, for all you've done for America since you've come here." Others attending the celebration included Passaic County Prosecutor James Avigliano and Weysan Dun, FBI special agent in charge of the Bureau's Newark office; the director of the New Jersey Office of Homeland Security; and various sheriffs and county prosecutors. The Board of Immigration Appeals overturned part of the order the following year, holding that Judge Riefkohl had erred in downplaying Israeli evidence showing Qatanani's links with Hamas. Qatanani remains in the United States pending the outcome of deportation proceedings. In 2008, Pascrell defended controversial New York City subway ads promoting Islam financed by the Islamic Circle of North America (ICNA). The ads featured phrases like "Head Scarf?" and "Prophet Muhammad?" on one side, with the words "You deserve to know" and "WhysIam.org" on the other. Rep. Peter King, R-N.Y., cited the high-profile role in promoting the ad campaign played by radical Imam Siraj Wahhaj (a former CAIR advisory board member and a frequent speaker at the group's events) in urging transit officials not to run the ads. Wahhaj was an unindicted co-conspirator in the 1995 federal trial of Omar Abdel Rahman (AKA "the Blind Sheik"), who was convicted of conspiring to bomb New York landmarks and is serving life in prison. Wahhaj has also called for the establishment of an Islamic state in the United States and urged Muslims to get involved in American politics because "politics are a weapon to use in the cause of Islam." After King pointed to Wahhaj's radicalism, Pascrell expressed disappointment that "any public official" would oppose the subway advertisements. Wahhaj's ad campaign "is exactly the kind of dialogue we need," one that would "bridge the gaps in our collective knowledge," Pascrell said. CAIR's New Jersey chapter sent out a July 31, 2008 action alert urging American Muslims and "other people of conscience" to thank Pascrell for "standing up to those who seek to marginalize the American Muslim community." found no evidence of "retreat or negligence" by the Clinton administration. Pascrell neglected to point out that the commission's report was sharply critical of both the Bush and Clinton administrations' handling of the threat. It found that the Clinton administration had as many as four chances to capture or kill bin Laden from December 1998 to July 1999 but failed to act. At a House Homeland Security Committee hearing on radicalization within the Muslim community last year, witnesses discussed the dramatic increase in jihadist terror plots on American soil. Pascrell attacked the premise that radical Islamic terror deserved any special focus, stating that "some pretty bad people come out of Catholic churches." One witness at the hearing was Melvin Bledsoe, whose son, Carlos (AKA Abdulhakim Mujahid Muhammad) was convicted and sentenced to life in prison for shooting to death one soldier and wounding another outside a Little Rock, Ark. military recruiting center in June 2009. Melvin Bledsoe testified about his family tragedy – specifically about his son's transformation from a normal American teen-ager into a jihadist. The elder Bledsoe's call for Americans to unite against jihadist recruitment efforts drew a sharp rebuke from Pascrell, who denied any divisions existed. "When you say 'the other side,' I don't know what the hell you're talking about," Pascrell told Bledsoe. "We are all in this together." There is no public polling data to indicate whether Pascrell faces any political backlash for collaborating with CAIR or treating with contempt a father who lost his son to Islamic radicalism. But there are indications that Pascrell's pro-Islamist views could be helping attract more Jews into the Rothman camp in this Democrat-dominated district. The website NorthJersey.com reported earlier this month that voter registration data from six Passaic County towns in the new district show that since New Year's Day (shortly after Rothman announced he would run against Pascrell) more than 900 voters previously registered as Republican or unaffiliated switched to the Democratic Party in those towns, with less than 200 switching from Democrat to Republican. In an effort to continue this trend, a recent letter paid for by the Rothman campaign urged Orthodox Jewish Republicans to switch their registration so they could vote for him in the June primary. A Pascrell spokesman suggested Rothman's efforts to encourage GOP party-switching constituted disloyalty to the Democratic Party, terming it "a slap in the face." But many in the local Jewish community may conclude that Pascrell's own behavior (and in particular his refusal to repudiate anti-Semitic slurs from prominent supporters like Aref Assaf) may be spurring Jews to cross party lines to vote against him. In an op-ed last month, Assaf suggested that opposition to Pascrell from the local Jewish community threatened to undermine what had been a "cordial and cooperative" relationship with Paterson's Arabs and Muslims. He hinted that Jewish opposition to the congressman would be regarded as evidence of anti-Muslim bigotry. Assaf claimed that Pascrell "is being condemned for failing to be 100 percent on the side of a foreign country (Israel)" and for "sleeping with a suspect community (Arab/Muslim) whose vote will most likely determine the outcome of the elections." "Sadly, politics, money, lobbying and disinformation are about to spoil whatever semblance of friendship and hope there are," he added. "The turf war has begun, and while we did not start it, the community of Arabs and Muslims in the district gave Pascrell victory. Jewish and now some mainstream newspapers have framed the June 5 primary as a litmus test for the survival of Israel." I read with great dismay this one-sided and conclusory piece. The insinuations and distortions as to the motivations of Congressman Pascrell are blatant attempts to rile Jewish voters to oppose his re-election. My fear is that writing like this, ostensibly in support of the strengthening the State of Israel, will actually do more harm than good. As a staunch supporter of the State of Israel myself, the records on behalf of both Congressmen running in the 9th Congressional District in New Jersey and their rating by AIPAC are almost identical. This piece intends to leave the impression that Pascrell has sided with Islamists and outright terrorists in his career in Congress. I point out that former Congressman Herb Klein and former President of AIPAC David Steiner, along with many other prominent voices in the Jewish-American community, are supporting Pascrell's reelection. Pascrell's pro-Israel credentials were defended by none other than his colleague Steve Rothman, who in a letter to The Jewish Standard in 2010 wrote, "Bill Pascrell votes in favor of issues important to the pro-Israel community." Using the same faulty logic as the author of this article, would these well-respected Americans, including Rothman be considered 'Islamist fellow travelers' as well? Of course not. The piece seems to suggest that Israelis and supporters of Israel are monolithic in their positions on public affairs involving the state of Israel. Nothing could be further from the truth. I point to several pieces recently in the New York Times, The New Yorker and other periodicals suggesting Israelis are very much divided on important issues of the day, and in some instances, oppose Prime Minister Netenyahu and the Israeli government's stance. A premptive strike on Iran is the most recent example of this. Finally, as has been raised in one article on the race in the 9th District, if your litmus test for gauging support for Israel and deciding who is worthy of Jewish American political support excludes otherwise excellent non-Jewish supporters like Pascrell (to the point of disparaging him in this article), don't you risk losing the hearts and minds of those Americans (including those who are Jewish) even less inclined to agree with you?